The Lord saw how great the wickedness of the human race had become on the earth, and that their every intention was evil. The Lord regretted ever making human beings, and His heart was deeply troubled. So the Lord said, ‘I will wipe from the face of the earth the human race I have created—and with them the animals, the birds and the creatures that move along the ground—for I regret that I have made them.’ But in the mist of those He plotted to destroy, the Lord favored Noah, a true man of God” (paraphrase of Genesis 6:5-8 NIV). The “Noah” trailer showcases multiple allusions to the Garden of Eden that depict the “fall of man.” According to this account found in Genesis 3 of the Bible, evil came about when Eve – the first woman created– ate of the forbidden fruit of the Tree of Knowledge of Good and Evil against God’s explicit will. 16 seconds into the trailer, a glowing hand, presumably Eve’s, reaches for the forbidden fruit from the same tree. The glowing effect of the hand may represent one of two things. The first is that, according to the Bible, Eve was the first woman created, designed in the image of God. The glow from her skin could symbolize a reflection of God’s Glory. If not for that reason, it could simply be an effect used to represent the flashbacks or visions director Aronofsky’s Noah will have of Adam and Eve. Those familiar with the “fall of man” story know that both Adam and Eve eventually ate of the forbidden fruit. This was the first sin ever committed in the history of mankind. This immediately resulted in a domino effect of sins, provoking God to ultimately kick Adam and Eve out of Eden. Upon their exit, God placed two guardian angels before the entrance of Eden to insure that they and the rest of mankind would never return. “So he drove out the man; and he placed at the east of the garden of Eden Cherubims, and a flaming sword which turned every way, to keep the way of the tree of life,” (Genesis 3:23-24 KJV). 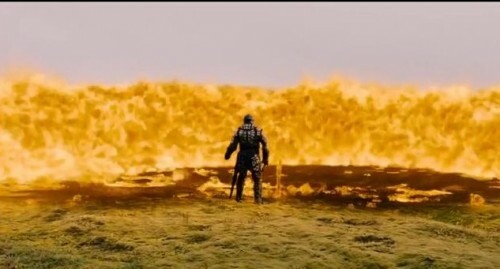 At 1:57 of the trailer, an armored figure thrusts its sword into the ground, sending a wave of fire out. This is most likely the same guardian angel God set at the entrance of Eden. After Eden, Adam and Eve gave birth to Cain and Able. As the story goes, both brothers made an offering to God. However, God didn’t accept Cain’s offering because it wasn’t the best he could offer. In a fit of anger, Cain slaughtered his brother, Able. 34 seconds into the trailer, we see the silhouette of Cain slaying his brother. Thus was the first murder in recorded history. The world would only evolve to become more wicked. 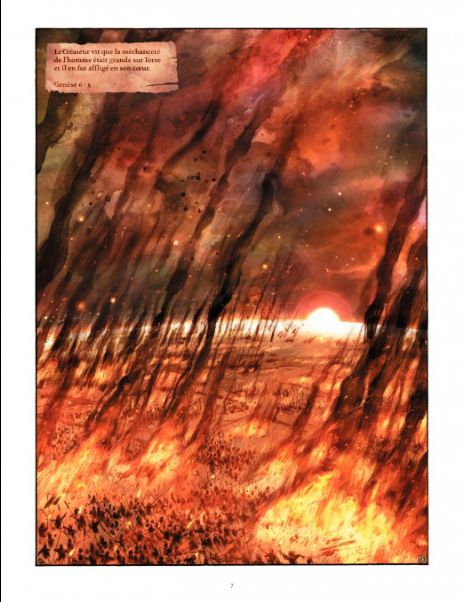 Beyond the allusions to Eden, various images of the apocalypse as described by the Book of Revelation are seen as well. 38 seconds into the trailer, a storm of hail and fire is seen obliterating the earth. 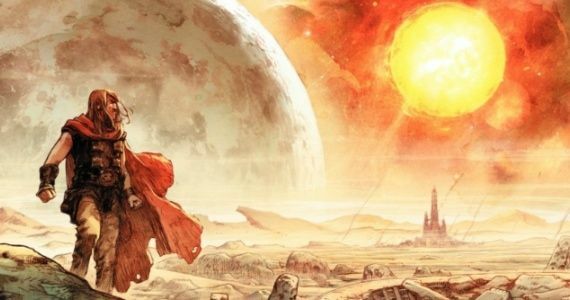 However, 31 seconds into the trailer, we see various characters walking through barren lands – according to Aronofsky, a post-apocalyptic world,. This is where “Noah” makes an interesting turn. There are three immediate sources that detail the direction Aronofsky is taking with this film. The first, of course, are the theatrical trailers. The second is by Drew McWeeny, a film critic who was able to get his hands on the script. 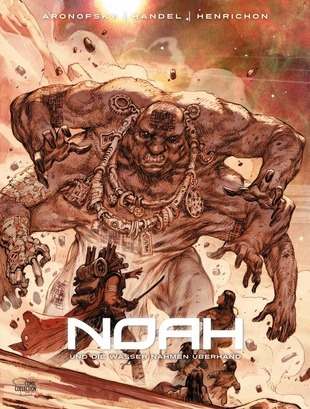 The third is the graphic novel series entitled “Noah,” which was co-authored by Aronofsky. Although all three sources reveal that “Noah” remains true to core elements of the traditional telling of Noah and the flood, there are also very noteworthy and potentially plot-twisting differences. The Animals: According to Genesis, God said that two of every animal would also board the ark with Noah and his family.According to Aronofsky, however, the animals seen in the film are “slightly tweaked designs of real existing animals.” No real animals were used in production at all. Is this “tweaked design” due to the alternative historical timeline Noah is placed in? Is this a nod towards evolution? Questions, questions. Most likely, this will be left up to the viewer to decide. We also see these animals flocking to the ark on their own accord. Again, how Noah collected these animals isn’t detailed in Genesis. However, God himself uniting these animals does seem more believable and Biblically plausible than Noah and his family trying to catch all of these animals on their own. The Flood: Another minor yet notable detail is seen in the trailer when geysers of water erupt from beneath the ground. Although not written in Genesis, this take on geysers aiding in the flooding of the earth still seems Biblically plausible. After all, an entire world flooded via rain alone seems like a unbelievably lengthy process. It would also allow time for men to seize and board the ark. 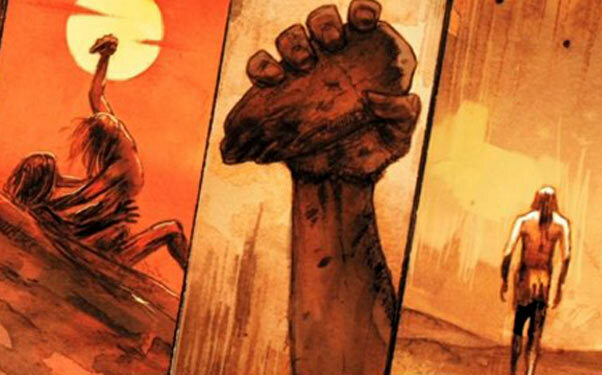 Noah the Warrior: According to the graphic novels, Noah is a warrior-like character. According the novel descriptions: “Noah is like no other. [He] is a fighter and also a healer.” This contrast actually makes sense in the world of violence Noah is found in. Separated from everyone as a man of God, he was an outcast. It is survival of the fittest, and Noah was definitely a survivor. Survival must have meant learning to protect himself and his family from the troubled and wicked people by forceful means. 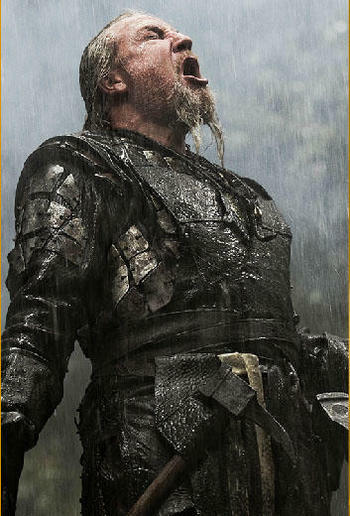 In the trailer itself, we see a resilient group of savage men approaching Noah and his family. According to Genesis, these men deemed Noah crazy as they have never seen rain before. For the earth to be flooded was a preposterous idea to them. Only until the rain began did they demand for Noah to accept them into the ark. In the trailer, these men shout and try to “take the ark,” a desperate attempt to survive the flood. In certain versions of the trailer, we see Noah the warrior spearing off these men as they attack the ark. 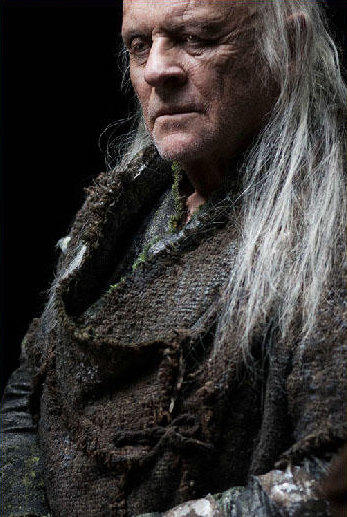 Methuselah: Although not a major figure in the Bible, it looks as if Methuselah will have a large role in “Noah.” According to Genesis 5:25-27 of the Bible, Methuselah was Noah’s great-grandfather and a descendant of Adam. He lived to be 969 years old, making him the longest-lived human ever. With almost a thousand years of experience under his belt, the film will most likely use him to narrate a historic account of the evil he has witnessed over time as well as God’s plan for the world. It will be interesting to see the creative interpretation the film takes on a character that is only mentioned in genealogical details (which interestingly follows the lineage of Jesus Christ of Nazareth). Six-Armed Giants: Here’s something the trailer forgot to mention. One of the more fantastical differences introduced in the graphic novels are the six-armed giants called Nephilims. Although a strange concept to reckon with, they are mentioned in the Bible. In Genesis 6, these creature are introduced: “The sons of God saw the daughters of men that they were fair; and they took them wives of all which they chose … There were giants in the earth in those days; and also after that, when the sons of God came in unto the daughters of men, and they bare children to them, the same became mighty men which were of old, men of renown.” However, although there were giants in this era, there is no detail of them having six arms. Many people have debated whether the “sons of God” refers to angels or men. For this to be understood, the original context of the Bible must be understood. First of all, the Hebrew words for the “sons of God” is B’nai Ha Elohim, which would indicate that they are Heavenly beings — more specifically: fallen angels. The children of these fallen angels and daughters of men were the Nephilims, who were “mighty men” and of “renown.” They were also “giants,” meaning their angelic parentage must have altered their human genetics, making them “super-sized people” (source). Whether or not Noah actually confronted these beings isn’t detailed in Genesis. But remember: there are many gaps in the story of Noah, which allow for creative interpretation. But I will admit: creative interpretation can get tricky and is always subject to getting a little out of hand. Era: The greatest of these differences is that every source besides the trailer detail a world “outside of time.” According to actress Emma Watson, the film has an ambiguous setting: “It could be set in any time. It c ould be set sort of like a thousand years in the future or a thousand years in the past … You shouldn’t be able to place it too much.” While the traditional telling of Noah takes place a few generations after Adam and Eve, Aronofsky’s graphic novels seem to place Noah in a post-apocalyptic world. This might be one of those “out of hand” interpretations I was talking about earlier. So far, “Noah” seems to be a loose adaptation of traditional sources. And the trailer looks very misleading. Upon initial glance, the trailer details a somewhat familiar Noah. However, the trailer makes no reference to the six-armed giants nor the post-apocalyptic world, both of which are key elements to Aronofsky’s “Noah.” To me, this appears very misleading for those familiar with the traditional telling of Noah. Aronofsky must remember that he is reaching out to a very large audience with this film— especially Christians. If the plot were to drastically deviate from the Bible’s account of Noah without preparing the audience for this change, many could be offended. 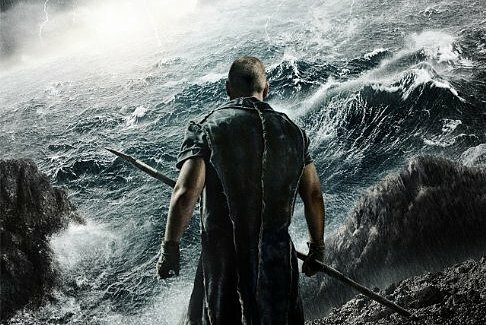 While Aronofsky has potential of creating a masterpiece and an artful telling of Noah and the great flood, there is an overwhelming risk that the traditional epic of Noah will be unrecognizable. What do you think? Do the differences matter? Will the film be successful regardless of it’s commitment to traditional sources? Leave a comment and let me know! Previous PostThe Amazing Spider-Man 2: The Sinister Six, Easter Eggs, and More!Next PostThe Avengers: Age of Ultron – Who is Ultron? Hi, good write up, let me just say that the giants were originally planned to be in, but the controllers called the illuminated ones who check out every movie, decided that they wished to hide the giants from this present age. Not the director’s fault. He simply has his hands tied.